Well if this just isn't the cat's meow. Stacey Griffin, a super-mom from New Orleans has a pretty unique idea for an environmentally friendly quick drink. Water...in a box! We especially love Aqua2Go because of the convenience it provides and its founder's commitment to making a difference in our environment. It even fits perfectly in our new Dwink box holder! Stacey, Aqua2Go's founder, is a business owner in New Orleans and lost everything during Hurricane Katrina. She was one of the fortunate ones though and did not lose her house. Since then, she has rebuilt her business as well as starting her new boxed water endeavor. Aqua2Go is purified by reverse osmosis purification and has a 5-year shelf life. Its packaging is aseptic which means it is a renewable resource (74% of the package is made from paper). Read more about the Aqua2Go packaging HERE. Stacey and her Aqua2Go team make it fairly easy for you to approach your local grocer, school, health club, etc. where you want to see Aqua2Go stocked on their shelves. Just print out THIS form and present it to the person(s) in charge of purchasing at said locations. You'd better believe I'm joining Stacey's street team! Look, even Ellen DeGeneres is a part of the street team! Aqua2Go is refreshing and easy to tote around on whatever journey you might be taking. 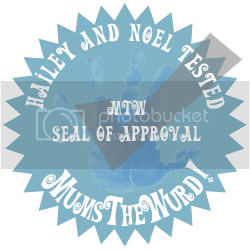 This product most definitely gets our seal of approval! This unique mom invention was thought up after Dwink founder, Yvonne Huang did numerous testing on other drink holders and they couldn't live up to her standards. If she still had to say, "Don't squeeze!" to her kids then they just weren't good enough. Dwink is made in the U.S.A and known as the universal drink box holder by many. You'll find that most drink boxes fit into its handy shape. Hailey and Noel are drinking Aqua2Go...learn more about that fabulous invention HERE. This unique product has even been featured in Real Simple, check it out (click on image to enlarge)! 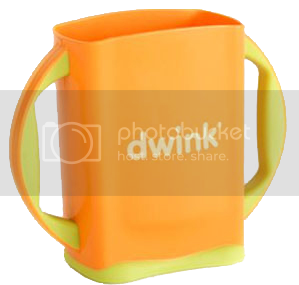 We have a Dwink box holder to give away to one luck MTW reader! The holder is orange, as pictured to the left. To enter, leave a comment on this post and let us know what YOUR most used baby word is (if you have one). Ours is actually "bwankie". It's just too cute not to repeat. This contest will end on Friday, September 7th at 10 pm CST.